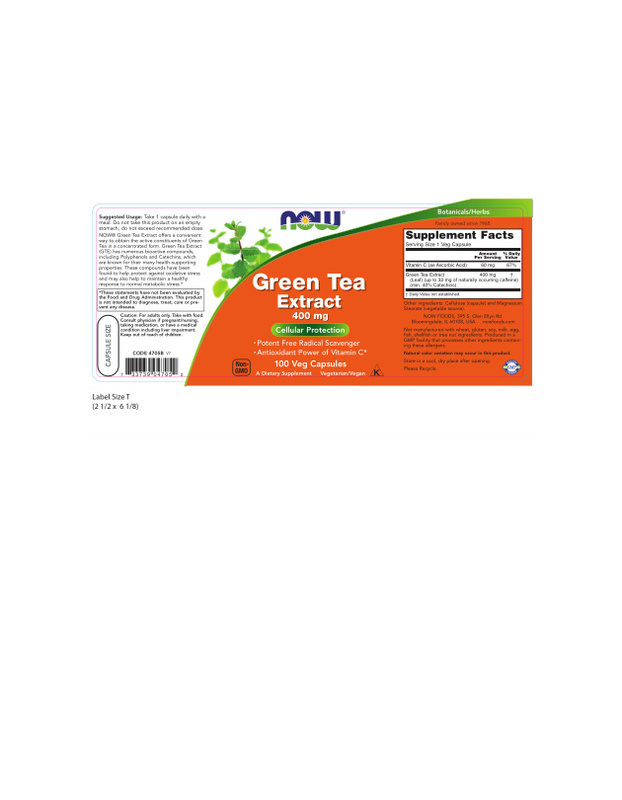 Potent Free Radical Scavenger Antioxidant Power of Vitamin C* NOW® Green Tea Extract offers a convenient way to obtain the active constituents of Green Tea in a concentrated form. Green Tea Extract (GTE) has numerous bioactive compounds, including Polyphenols and Catechins, which are known for their many health-supporting properties. These compounds have been found to help protect against oxidative stress and may also help to maintain a healthy response to normal metabolic stress. * Natural color variation may occur in this product. Take 1 capsule daily with a meal. Do not take this product on an empty stomach; do not exceed recommended dose. Store in a cool, dry place after opening. Supplement Facts Serving Size: 1 Veg Capsule Servings Per Container: 100 Description Amount per Serving % Daily Value * Percent Daily Values are based on 2,000 calorie diet.† Daily Value not established. Vitamin C (as Ascorbic Acid) 60 mg 67% Green Tea Extract (Leaf) (up to 32 mg of naturally occurring caffeine) (min. 40% Catechins) 400 mg † Other Ingredients: Cellulose (capsule) and Magnesium Stearate (vegetable source). Not manufactured with wheat, gluten, soy, milk, egg, fish, shellfish or tree nut ingredients. Produced in a GMP facility that processes other ingredients containing these allergens. Caution: For adults only. Take with food. Consult physician if pregnant/nursing, taking medication, or have a medical condition including liver impairment. Keep out of reach of children. Natural color variation may occur in this product. Store in a cool, dry place after opening. Please Recycle. Family owned since 1968. For adults only. Take with food. Consult physician if pregnant/nursing, taking medication, or have a medical condition including liver impairment. Keep out of reach of children.